Good morning, everybody. Welcome to today's rendition of Lifesize Live! This is a live broadcast, and I’m Nikhil Gour. I’m here this morning with Mr. Rich Long from ScanSource out of Greenville, South Carolina. Thanks so much for joining us. So today we're going to be talking about business being personal. So, Rich, you've been doing this for quite some time now, and I'm really excited to meet you and have spoken with you quite a bit this morning. I wanted to kind of get your thoughts on what business being personal means for you from where you’re sitting. It's not a new concept. I don't do business with Lifesize as much as I do business with Nikhil, Craig, Tom, Tim, Felicia, David, and Jordan, but it's those collective experiences that I have with working with you individually that make up the partnership of Lifesize. That’s what business being personal means, and I'm hoping that our partners and our other supplier partners feel the same way about us. That's what business being personal means. Okay, so can you talk a little bit about how video and technology as a whole really kind of comes into play with that? How can you draw the line between technology being helpful and when it starts getting in the way? We should start with where we're at right now. We're at the headquarters of Lifesize in Austin, Texas. You make killer video conferencing products, right? And so video conferencing, video messaging, and video chatting have changed a lot in the last years. It used to be large, medium, and small conference rooms that are outfitted with video conferencing gear. It's still a popular place to go to have meetings, and our meeting rooms are always booked. The need to meet in person to collaborate, share papers, and write things on a board is still there, and those are things that you can't do on a desktop or a mobile device. However, that's what's proliferated, and what has really taken off is the one-to-one conversations that happen. I walk around our office, and I often see people having one-on-one conversations with people on their desktop video that you didn't see a few years ago, and that helps enable business to be personal. Just before I got here on the Uber ride over, I was using your app, having a video conference chat with somebody where others could join in. It was different than FaceTime, but FaceTime is that consumer technology that we're used to using, and that makes it natural for us to bring it into the business and make business personal. I was using your app to have a three-person conference on the way in, and that felt more personal than just being on an audio call. Yeah, it really helps the natural progression of it being a little awkward at first when you're on video. Some people might not be used to it — you have your generational differences and things like that. But then it's like, “Oh, I'm using Snapchat every day, or I'm using FaceTime every day.” What's the difference between using it there versus jumping into a conference room and actually having a business-related meeting? We still have those. We can't get away with having those bigger conversations within a room where we're sharing dialogue with multiple people right in the same room, and we have to share content or collaborate by way of drawing on boards and then capturing information. You can't do that so much with mobile devices or on desktops, but it's those devices and small ways of making it easy to connect on a desktop that have made that business communication more personal. Right, it's kind of nice to have the best of both worlds. You can be in an Uber and have a conference with someone. You had a conference with me earlier today and yesterday, too — it's very nice to just have that in your pocket, but then, also, when you get to the office or you get to the Lifesize headquarters, it might make more sense for us to jump into a conference room. I think it makes the conversation and the topic you're talking about more personal. If you're having a tough conversation with somebody and you're doing it one on one, whether it's on your phone or on the desktop, it makes even tough conversations or challenging situations easier when you can personalize it. Yeah, and then you've got the whole thing with body language, too. If we were just having a phone call, I could be picking my nose and just doing whatever. It doesn't really matter because you can't see me. You could be picking your nose, Nikhil. That's right. So, really, from the personal side of things, I guess, how do you draw the line? How do you say, “Okay, we're using technology for this meeting, it's going great, it's making our days more productive, it's making the meetings more meaningful”? At what point does it get in the way, or does it get in the way? Yeah, that's a good question. I'm not sure if it does get in the way. I'm not sure if you make a limit or if there's a threshold to not meeting in person versus over video. I think you just have to have it happen naturally. In the past videos that you guys have done, you talked about managing millennials and you've also talked about the ease or simplicity of video conferencing. Those things have changed enough to where now it's more natural, and I almost think you just have to let it happen. There are always going to be people who don't feel as comfortable having a video chat or situations that won't involve it, so my opinion is that I don't think it's something that you need to limit or curtail. I think it's something that just happens naturally, and as that natural occurrence happens, then it becomes more personal. Right, right. And you know, today it's very natural. We've just been talking on this live session here, and we haven't had any awkward moments or awkward silences. Yeah, it's funny. I'll stop you right there. I think what you meant was record to post or record to then archive and see later. And funny enough, this is actually being broadcasted live with our Lifesize streaming service. Yeah, I doubt that. I would never have agreed to a live video stream. Now, this is awkward. I guess this is our awkward time. You're making it weird. So as we record this to archive and post later, not stream now, that's a very personal way of getting a message across. Doing it spontaneously, or even planned live, one on one through video conferencing is a way to do it. Recording something or streaming live like we're doing right now and broadcasting it or sending it out intentionally is another personal way of doing things because, even though it's not receiving a two-way conversation, it's still putting a face to a concept or a face to a conversation. If you're videoing a product demonstration or showing what it looks like when you receive a product and opening the box, that makes somebody feel the experience before they can even get their hands on the actual product, and that makes it more personal. So it doesn't just have to be two-way: it can be one-way, just like we're doing live. Absolutely. It looks like we're running out of time here, too, but I just wanted to let you have a couple of minutes here to say any final thoughts, any closing thoughts, any things you've observed over the years and where you'd like to see this go. Well, I wasn't a natural user of video conferencing or chat myself until just a few years ago — maybe even just two years ago. So I've seen it happen in real time in front of us, and as a provider of technology solutions to people, it's funny that I myself was a bit of a lagger to using it, but it's all about ease of use. And so if it's not easier to use, or if it's not natural to use, obviously you don't do it. You just choose to do what's natural or easy for you. And for me, for years it was picking up the phone because that is a personal two-way conversation. But there's something about video that makes it more personal, and the more personal we can make business, the better we are as partners. I'm happy that you guys can make it easy for partners for businesses, and I think that only serves you well when people try to make business more personal. Couldn't agree more. Well, Rich, thank you so much for joining us today. An absolute pleasure, and I'm really looking forward to continue working with you guys in the future. 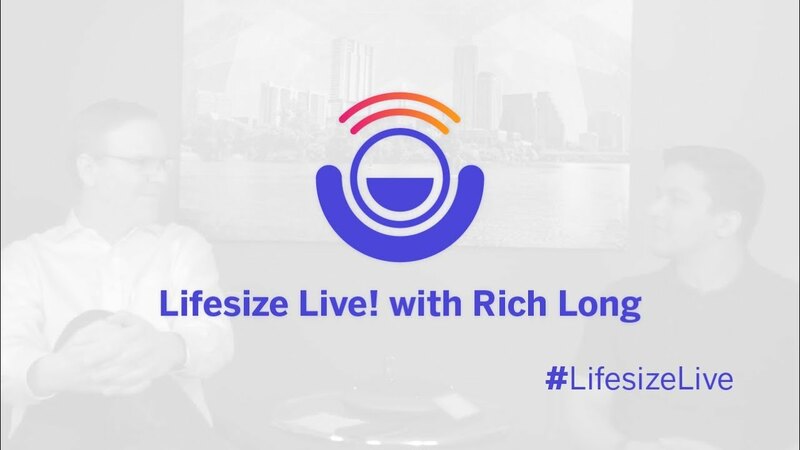 Join us next week for Tuesday's edition of Lifesize Live! Thanks, everybody, have a great day.